Was this Elizabeth Courtenays' Chest? This elm boarded, six plank coffer was discovered in the West Somerset village of Sampford Brett, which lies between the Quantock hills and the Brendon hills. It was recovered from a barn, which had not been disturbed for at least thirty years and probably for a lot longer. This area of West Somerset is well known for its use of local elm trees, not only for furniture but also in the construction of houses, for their doors, beams, and floorboards. Some years ago I was asked to examine the contents of an old cottage whose owner had sadly passed away. Every thing in it was two generations old. Every piece of furniture was made from local elm and had been crafted locally. It was all of fairly primitive construction and over the years had gained a wonderful colour and patina. The coffer was obviously locally made. 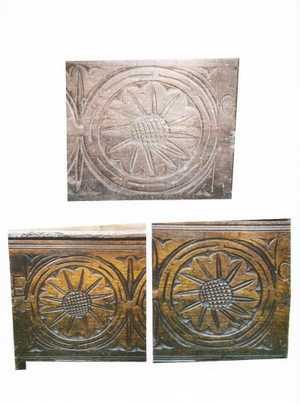 The flower decoration is a fairly typical West Country design, used in primitive scratch carvings on 15th century stone fonts in Devon and Cornwall, as well as in sophisticated decoration on some pieces of 17th century oak furniture. 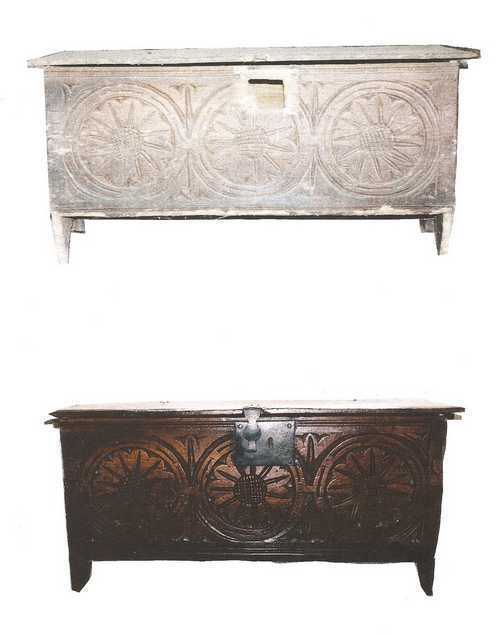 However, our coffer has cross hatching or nail head decoration in the centre of the flower, which does not appear on much Somerset furniture, although, it does appear on some pieces found in Dorset. A lucky break came when visiting the parish church of St. Mary the Virgin at East Quantoxhead, a small village, north of the Quantock hills, on the Bristol Channel coast. 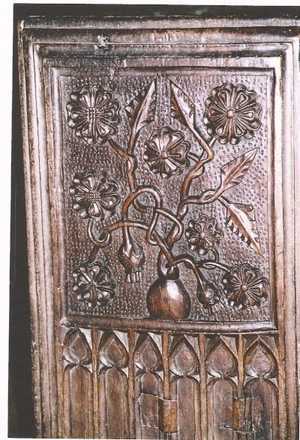 Here we found an early 16th century bench end, decorated with a foliage and flower carving. The flowers have the same cross hatching decoration as the coffer. These bench ends are original to the church, and would have been installed between 1520 and 1530. There is a definite association between the carved decoration on the coffer, and this bench end. The front of the coffer is decorated with three large flowers, with a letter "E" to their left, and a letter "c" to their right. A neighbour whose interest was in local history found that a woman named Elizabeth Courtenay lived in the parish of Sampford Brett in the early years of the 18th century, and although not in a direct line, she was a descendant of the Earls of Devon. The coffer is of late 17th or early 18th century construction, the letters E & C could refer to Elizabeth Courtenay, either to commemorate her christening, or possibly her marriage to John Chichester, in 1732. We know that the two manors, Torweston and Sampford, were purchased by Hugh Courtenay, Earl of Devon, and his wife Margaret in 1359 from William (or Edmund) and Alice Brett. The Earl died in 1377 and his widow in 1391, and the manors passed to their fourth son Sir Philip Courtenay (d.1406). The manors stayed in the Courtenay family, and Margaret, wife of the last John Courtenay held the estate until her death in 1743 when it passed to Elizabeth, wife of John Chichester of Arlington, Devon and sister-in-law of Margaret. John Chichester of Arlington married Elizabeth Courtenay, spinster, youngest daughter of John Courtenay, late of Molland in 1732, the marriage was arranged by her mother Margaret -"whereas a marriage is agreed upon and surrounded by God's permission." Elizabeth's dowry was £2000, together with an estate consisting of many manors in both Devon and Somerset including those of Sampford Brett and Torweston. She held the estate until her death in 1763 when her granddaughter Anna Maria Paston inherited, until her death in 1791. Elizabeth Chichester (nee Courtenay) was baptised on 26th Nov. 1693 at Molland in Devon, she was the eighth child of John Courtenay of Molland and his wife, Amy Clifford. It isn't known exactly where Elizabeth and John spent most of their lives, but as it is record that the Courtenay family owned Sampford Brett from 1359 -1846 it is probable that they lived some of their time in this area. It is a strong possibility that this chest was at one time treasured by Elizabeth Courtenay. Another link between the Courtenay family and Sampford Brett is a silver plate hall marked for London 1742 with a coat of arms, inscribed "The gift of Margaret Courtenay to the Paris! of Sampford Brett." Margaret, mother of Elizabeth died in 1743. The coffer has now been sympathetically restored and, hopefully, will survive for another three hundred years. The photographs show before and after restoration; the coffer was discovered in the Spring of 2003 and restored in2008. It now has a safe home in the village.